In other words, it’s all about terroir. Lagrein don’t care about wars, country borders, or any other man-made conflicts. It found a spot it likes, in a sometimes-unforgiving alpine climate, and it is thriving. 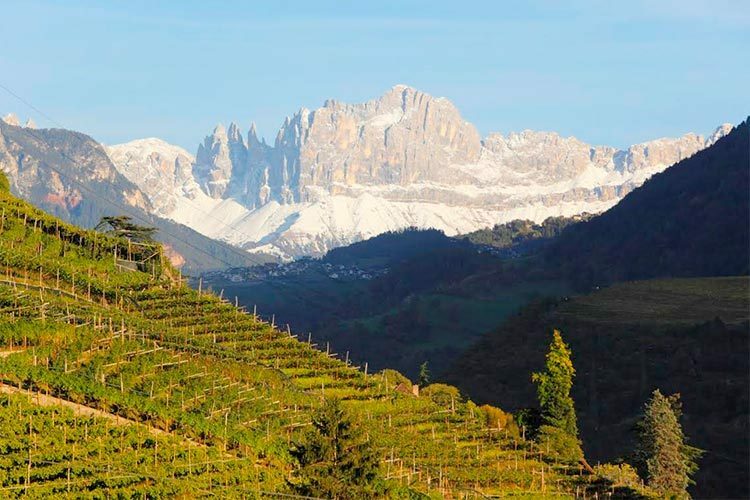 In mountainous regions especially, there seems to be a strong bond between the climate and certain grapes, and Lagrein’s match with Alto Adige is no exception. We can come up with all sorts of other ways to describe terroir, but for me, that just about sums it up. Tasting through several Lagreins recently, I discovered a refreshing typicity, especially with the non-riserva wines (those aged in large oak casks or steel). Though each wine offered something different – a few featured earthy, rustic notes, for example – there were characteristics that clearly identified every bottle as Lagrein. Aromatically, a violet, floral bouquet recalls Syrah (a cousin), but only just. (La Cucina Italiana identifies this scent as brunelle, a local name for wild orchids found in the region.) On the palate, bright plums and and blackberries lead the way, with black tea and more violet – or brunelle – notes. As it finishes, there’s an almost soapy aspect we’ll call lavender, lest you think it punishment for foul language, which it is most certainly not. Perhaps unsurprisingly, the riservas, or wines aged in small oak barrels – which can cost significantly more – tend to relinquish some of this typicity. Oak softens the floral nature of the aroma, and though spicy flavors on the palate can add intrigue, they also obstruct those special orchids & plums. Riservas are, of course, made for longer aging (10 years or so), but – and take this to heart coming from a lover of aged wine – I’m not sure, in this case, they offer more than the wines meant for everyday drinking. Pairing-wise, Lagrein of course plays well with the foods of the region, including the legendary speck (smoked, cured ham), as well as beef or game stews. Polenta, mushrooms and root veggies are also common. I love it with fresh pork preparations too, such as grilled chops, roasted tenderloin, or stewed shoulder. Unterholzner suggests braised (in Lagrein, obviously) veal cheek on top of celery root puree. Great article, Mike, and very informative on this lesser-known variety… Makes me want to run out and find one now to try! Thanks Kevin, appreciate it. And, um, I know of at least one vineyard growing Lagrein in ChesCo, so, although the mountainous terroir might be lacking, there’s precedence!